Teeth clenching, or bruxism, may not seem like a serious condition. But, it has the potential to cause an array of dental and general health issues. From damaged teeth to headaches, bruxism is a condition that you may not be aware of until you feel the collateral pain it causes. 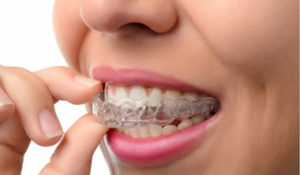 Bruxism can be a consequence of stress and anxiety, or an abnormal bite. It often occurs during sleep and those affected may not even be aware they grind their teeth. If you regularly wake up with dull headaches or a sore jaw, there’s a strong possibility you have bruxism. If you show signs, you should consult a dentist who can better assess your situation. Typically, grinding your teeth is more annoying than it is harmful. However, chronic cases can cause dangerous wear and tear to your teeth. Chronic grinding can damage the integrity of your teeth. If left untreated, you may require bridges, crowns, dentures or implants to restore strength. If you’re experiencing pain that you suspect to be from bruxism, contact us at Country Isles Dental to learn about your options.